African Innovations, a highly selective assortment of works from the Brooklyn Museum’s extensive collection of African art, includes objects of transcendent beauty and sophistication, but many of these works were valued for more than aesthetic reasons. They were created to solve important creative, social, political, and cosmological problems. The phrase “African art” might suggest a continent-wide form of visual expression that is unitary and timeless, but nothing could be further from the truth. The world’s second-largest continent is a place of great diversity, encompassing massive deserts, mountains, tropical forests, and broad savannas, and home to more than a thousand languages. Historically, Africa has been organized into a variety of expansive empires, localized kingdoms, city-states, and autonomous villages, and today it comprises more than fifty independent countries. While that diversity is reflected in the stylistic range of this exhibition, these inventive works also reveal the universal nature of the individual and social problems they addressed. For the first time, the Museum’s African galleries are arranged chronologically, to emphasize the continent’s long record of creativity, adaptation, and artistic achievement. 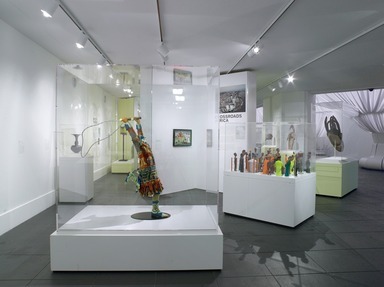 The installation is framed by displays focusing on “Crossroads Africa.” The first, beginning in ancient times, establishes Africa’s ongoing history of artistic dialogue with other parts of the world and neighboring cultures, while the last extends this story into the present. The majority of works, dating from the early nineteenth to the mid-twentieth century (when collecting was at its most active), are displayed between these two spaces according to five broad themes: protection, transitions, authority, performance, and personal beauty. 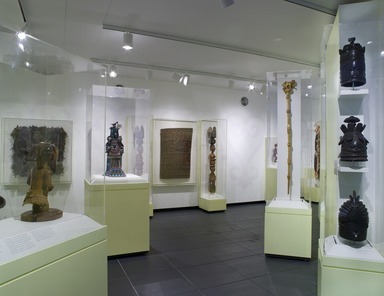 This museum was the first in America to display African objects as works of art and has one of the largest and most important collections in the country. 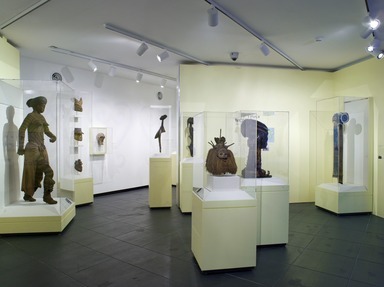 We invite visitors to view the collection with new eyes through this installation, which places centuries of ongoing African creativity in historical and cultural context. Nubia is the land between the southern border of ancient Egypt at Aswan and the northern part of the modern Republic of the Sudan. The ancient African cultures and civilizations of Egypt and Nubia were closely related: Egypt dominated Nubia politically in the earlier periods, but Nubia conquered Egypt in Dynasty 25 (760–656 b.c.e.). Nubian art reflects burial traditions similar to those of Egypt. More Egyptian and Nubian art is on view in Egypt Reborn: Art for Eternity on the third floor. Africa, the prehistoric point of origin of all human beings, has a long and complex history of artistic development and cultural interaction. All of the cultures represented by this selection of objects, ranging from the seventh century b.c.e. to 1800 c.e., produced significant artistic innovators and belonged to wide-ranging networks of adaptation and exchange. Nubian art, constituting the oldest group of works in the exhibition, reflects centuries of invasion and exchange, in both directions, with its Egyptian neighbors to the north. A work from Roman-era Egypt represents a new Greco-Egyptian god, offering a striking example of artistic and religious invention from the African continent. A terracotta head from the Nok culture, in modern Nigeria, stands as a testament to one of the oldest known art genres from south of the Sahara. Despite considerable geographic obstacles, sub-Saharan African civilizations were connected to far-reaching networks of exchange. The Edo city-state of Benin, for example, grew exceedingly wealthy through trade with Portuguese merchants at the apex of its power in the fifteenth and sixteenth centuries. The Edo bartered ivory and captives from neighboring societies for European guns and brass, a material used by their artists to make plaques and other innovative objects such as those presented here. The nineteenth and early twentieth centuries—represented in the next five sections—were a period of profound change and disruption for African societies. The profusion of power figures and protective masks, while part of an ongoing local history, is certainly related to the growing European presence on the continent, which brought iconoclastic missionaries, local apocalyptic movements, economic exploitation, and the loss of political independence. The works here served as tools for controlling spirit forces to protect individuals and communities, often through the incorporation of symbolic or powerful materials such as feathers, horns, shells, plants, and bones. 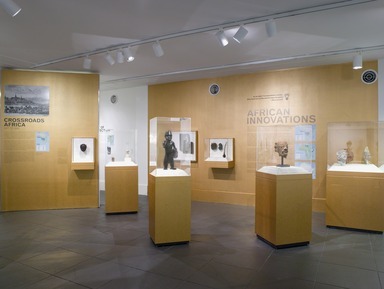 Most of these works are rooted in conceptual distinctions between the “wilderness,” the zone beyond the village and cultivated lands that was home to ancestral spirits and potentially ominous forces, and “civilization.” Blacksmiths, who often also worked as carvers, and diviners, who specialized in intervening in the “wilderness” on behalf of “civilization,” created and used these sculptures to harness spiritual forces to aid the community. Through these works, African artists sought control of a world changing around them. The works in this section were made for use at key moments of transition in life: death, birth, and initiation into adulthood. Created in an era when local beliefs were facing severe challenges, they offered a sense of perpetuity. In many indigenous African cultures, life is thought to reach beyond the current world, extending in both directions to encompass deceased ancestors and the not yet born. Ancestors are able to intervene in the world on behalf of their descendants. Their blessings and wisdom are often sought through specific objects such as grave markers and reliquaries, both associated with the physical remains of the deceased. Births, in turn, occur with the sanction of the ancestors, and in some cases are considered to be the return of a previously departed spirit. In the prime of life, the transition to adulthood is marked by art objects that accentuate a similar phase of “death” and “rebirth.” Through initiation, a young boy or girl entering into a more mature level of knowledge is physically separated from his or her previous life in the village for a number of months before reentering society as a man or woman. Arts associated with authority flourished in the nineteenth and early twentieth centuries—most likely in response to the fluid political environment of this period. For instance, following the collapse of the Oyo Empire in 1836, smaller city-states and kingdoms emerged among the Yoruba, and obas (kings) commissioned spectacular carved and beaded works, including the ade (crown) from Ikere shown nearby, to project their newly enhanced powers. The forms of political leadership in Africa were as diverse as the continent itself, ranging from emperors, kings, and local chiefs to independent councils of village elders. In all cases, art served as an important means for leaders to communicate local histories and their own authority, and rulers played a significant role as artistic innovators. Objects made for royal use are often distinguishable from ordinary utilitarian ones by the rare, unusual, and costly materials from which they are made, such as gold, bronze, or ivory, and by their extensive detail and ornamentation. In societies without kings or paramount chiefs, however, masks might be used to administer justice, as in the case of the judicial masks made by the Dan of Liberia. Masks allow us to hide, but also to reveal unseen traits and to enact different identities. Masquerade is a universally shared human experience, and one that depends upon interaction between artist and audience. It is performance art. The works on view here were not meant to be seen as isolated sculptural forms, though they remain stunning examples of artistic achievement. Instead, they were but one component in a performance that included costume, music, songs, food, audience interaction, and, above all, movement. Masquerade remains a wholly adaptive medium, incorporating new themes and characters in response to changing times. The functions of masks are as complex and varied as their forms. Masks can validate political authority, initiate youths into adulthood, protect communities from harm, assist the spirits of the deceased in their transition to the realm of the ancestors, teach social values, and simply entertain. The nineteenth- and twentieth-century masks in this gallery are loosely divided into three groups—masks marking important transitions in life, masks supporting political authority and social continuity, and masks honoring women. In Africa, one’s commitment to style is taken as a sign of seriousness and achievement. Arts of adornment are in broader use than the highly specialized objects shown elsewhere in this exhibition, but these fashion statements equally reveal talent, ingenuity, and technical sophistication. Historically, African artists have adapted a wide array of materials to highlight a wearer’s sense of fashion and status. Gold, ivory, and beads have long been used as media of prestige, indicating the wealth and standing of the wearer. African textiles are extremely diverse (a small, contemporary sampling is included here), ranging from fabrics woven in strips to pounded barkcloth to factory-printed cotton. African fashion tends to employ an aesthetic of assemblage and improvisation. Men and women continue to blend patterns, textures, and media in an endless variety of new combinations. Although the works here are primarily examples from the nineteenth and early twentieth centuries, African innovators continue to explore the art of the self on a daily basis. Indeed, African artists remain an ongoing source of inspiration on fashion runways around the world. Africa underwent profound change during the second half of the twentieth century. Independence movements brought new sovereign states to the global stage, while social change ended some religious, economic, and family institutions as new versions took their place. Today, roughly half of all Africans live in urban settings, and Lagos, Nairobi, Dakar, Johannesburg, and other metropolises are truly global cities, interconnected with worldwide networks of trade, migration, and ideas. African artists in urban centers on and off the continent have responded to these changes, working in media such as painting, photography, and video to express these new realities. At the same time, artists outside of cities working in established genres such as masquerade are also changing and adapting to new circumstances; the Elvis mask by a Chewa artist in this gallery is a striking example. Questions such as “What is Africa?” and “Who is African?” remain central concerns for much contemporary art. 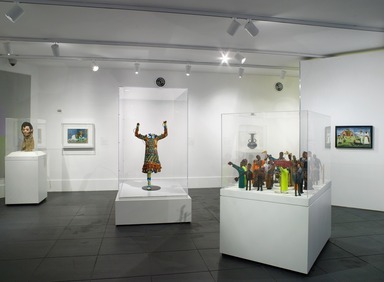 This section of the installation presents a range of artists, some with transnational identities, who are claiming a part in African art history while drawing on global perspectives. They continue an ongoing history of African innovation. Why are the artists "unidentified"? In African art, as in many fields ranging from the arts of the Americas to European medieval art, we often have no record of the artist’s name. The reasons for this are varied and complicated. Most of the cultures represented here relied upon oral histories, which may not have memorialized artists’ names. In some cultures, the names of artists were deliberately obscured because the works were considered to have an otherworldly origin. In other cases, although the identity of an artist may have been known locally, the original collector of the work simply did not record it. Through a combination of careful historical research and visual analysis, it is often possible to ascribe a body of works to an individual hand, if not a known name. Thus, some works here are attributed to specific artists such as Toibo of Erin or the Nguabu Master. After their transfer to Western collections, African art objects went on to have new histories of ownership (or provenance) that reveal the changing circumstances in which they were understood. For instance, in the early twentieth century, African artworks were sometimes studied in the context of anthropology or later admired by modernist artists primarily for their formal qualities. Look for specific notes on provenance near objects that had especially interesting previous owners. 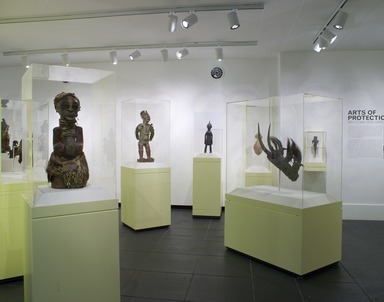 April 1, 2011 Beginning August 12, 2011, the Brooklyn Museum will present a long-term installation of 200 of the finest objects from its renowned collection of African art in the recently renovated gallery space on the first floor. 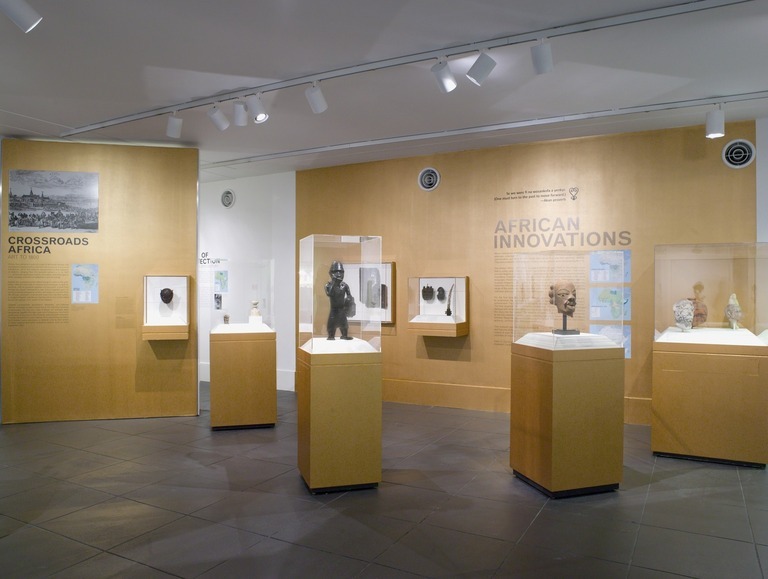 African Innovations, a chronological and contextual reinstallation, will be on view while the galleries in which the African collection has been installed since 1935 undergo large-scale renovation. 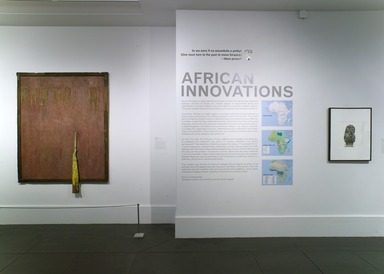 African Innovations, in which works will be arranged historically for the first time, will be framed on either end by two displays. The first, containing masterpieces from the seventh century B.C.E. to 1800 C.E. by artists ranging from those of ancient Nok and Hellenistic North Africa to the Sapi of Sierra Leone and sculptors of the ancient kingdom of Benin, will establish a pattern of Africa’s ongoing interaction with other parts of the world. The other display, with a selection of contemporary works, will bring this story up to the present and represents the Museum’s first dedicated space for works from present-day Africa. Selections from the African collection’s largest portion, which dates from the early nineteenth to the mid-twentieth century, will be installed between these two end displays, organized by five themes: protection, authority, transitions, performance, and personal beauty. 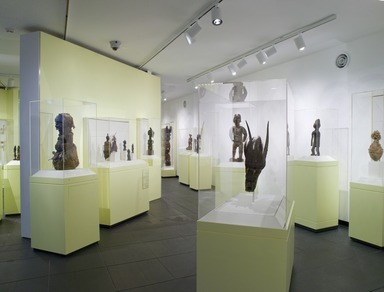 Among the works on view will be the sculpture Figure of a Horn Blower, an important example of Benin’s history of stylized naturalism; Mother with Child (Lupingu Lua Luimpe), a Lulua sculpture from the Democratic Republic of the Congo that is considered to be one of the great masterpieces of African art; Snake Pendant, a small, delicate work in gold by an unknown Ebrié or Baule artist; and Skipping Girl by Yinka Shonibare, a contemporary artist whose figures examine the history of interaction between Europe and Africa, making particular use of Dutch wax fabric, a commodity created in Europe and sold in West Africa. 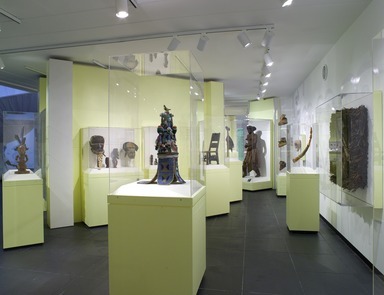 The Brooklyn Museum was the first museum in America to display African objects as works of art and has one of the largest and most important collections in the country. 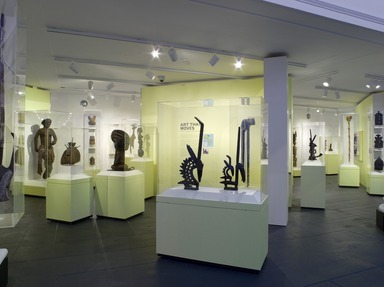 African Innovations continues the Museum’s pioneering history in the field, inviting the visitor to examine the Museum’s world-famous collection with new eyes and to celebrate centuries of African creativity. 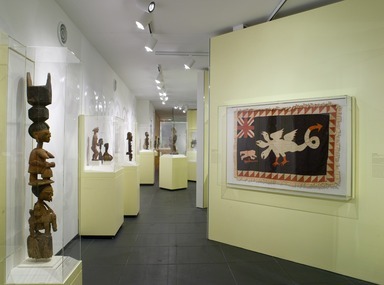 This reinstallation has been organized by Kevin Dumouchelle, Assistant Curator, Arts of Africa and the Pacific Islands, Brooklyn Museum.